A post entirely devoted to the wonder that is Korean food has been long overdue and to prevent myself from blogging about things that are currently frustrating me, I will instead write about food. Where to begin? For me, part of the joy of traveling is simply sampling different culinary treats. I love trying new and often unidentifiable foods and flavors. My mouth gets excited just thinking about it. Of all genres of food that I've tried I would put Korean food at maybe number three in the world. Mexican food gets the top spot, middle eastern/Mediterranean coming in second, and Korean coming in third. There is tough competition on my top ten world foods list because I really love so many different foods. So why does Korean food claim the number three spot? I have a bit of an obsession with garlic. As a young girl I thoroughly enjoyed helping my mom cook when using garlic cloves was involved. I readily volunteered to peel and slice the garlic because it meant I could snag a few raw garlic cloves as a snack. I was informed that eating raw garlic, while healthy, is not always pleasant for those that surround me so I eventually stopped the habit after I realized that my pores would practically start oozing garlic scent for about a day after my garlic feast. But in Korea garlic is in practically everything tasty. When you order Korean BBQ (as we call it in the States) you have the option of roasting garlic cloves with the meat and these cloves are often eaten by themselves. Yes! I can finally eat garlic without judgement. I really can't imagine food without garlic. It adds so much to almost anything. I am happy that Korea has embraced garlic wholeheartedly regardless of its more undesirable effects after eating. I have lived in Korea for almost 8 months exactly now and I have barely scratched the surface of the variety of foods that exist here. I look forward to school lunch every day to see what new treat awaits me. There have been absolutely no repeats of lunch since I arrived. There is ALWAYS some new combination of soup and side dishes. A friend and I looked up a comprehensive list of Korean foods and have now made it a goal to try new things for the next four months. 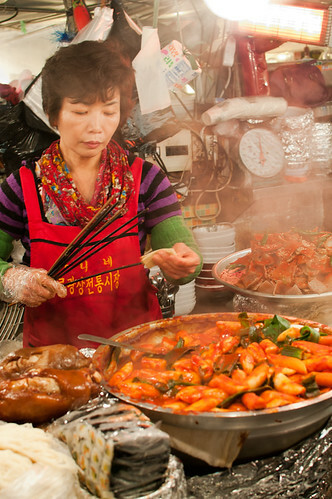 Perhaps because 99% of Koreans eat Korean food 99% of the time, Korean food is dirt cheap. I can get a filling meal for less than $4 easily and get a relatively fancy meal for less than $10. It is actually often cheaper to eat out then cook if I'm just cooking for myself. Typical Korean dining experience: Enter restaurant and sit down (generally you choose your own table). "Yo-gi-yo" (means "come here") the waiter or waitress (basically you yell across the restaurant for someone to serve you and it is not considered rude). Order your food. Approximately one minute later standard side dishes arrive, usually some combination of kimchi, other fermented vegetables, perhaps some kind of unidentifiable seafood, Korean pancakes, etc. The best part about these side dishes is that they are unlimited. Approximately five to ten minutes after you have begun to chow down on the wonderful unlimited side dishes your meal arrives, piping hot, fresh and delicious. As an extremely impatient person who in U.S. and other countries came up with various methods of making the food SEEM like it was coming faster, Korean restaurant service is perfect in my eyes. Granted, if the food didn't come fast there would probably be a riot in the restuarant because Koreans are quite possibly the most impatient people I've ever met (even more impatient than me). Korean food is extremely delicious but uses very few basic ingredients. I've told my Korean friends that if suddenly chili peppers, garlic, rice, and cabbage disappeared from the world, all Koreans would perish. I don't think Koreans could survive without these key ingredients. I'm a little concerned that I won't survive when Korean food is taken out of my diet in four months. Bipimbap- this is a favorite among many foreigners. It is rice, a variety of cooked vegetables, usually an egg, sometimes small bits of ground meat, then mixed with a semi spicy red paste. 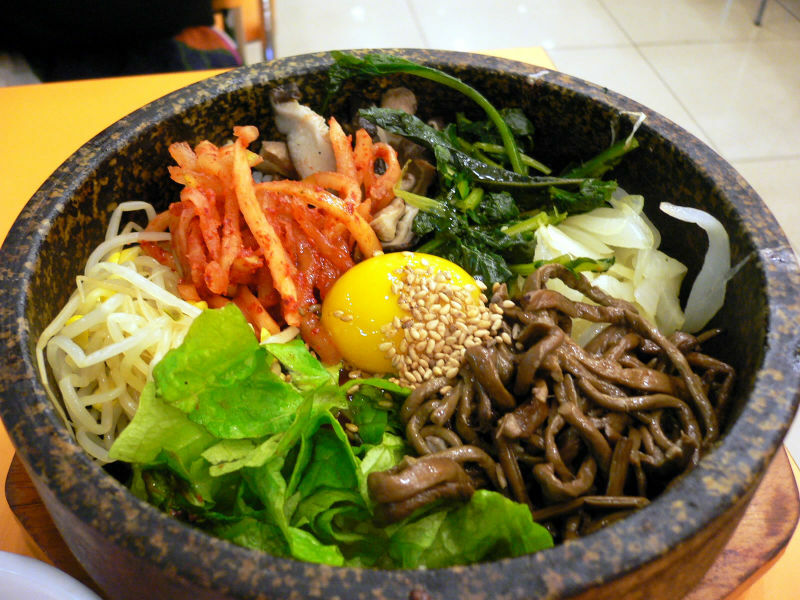 You can also get Dolset Bipimbap which comes in a hot stone dish and everything cooks while you mix it. Kimchi Jjigae- this is a kind of stew with Kimchi, tofu, onions, and pork. Served with rice that you can mix in with the stew. Spicy and delicious! Ttoekkbokki (probably a bad romanization of it)- This is made of Ddoek (thick rice noodles), fish cakes/sticks (not really sure about the translation of them), green onions, sometimes hard boiled eggs, and delicious spicy red sauce. You can find this dish on the street for around 1-2000 won! Cheap and delicious! Kimbap- not to be confused with Sushi. While Kimbap has similar ingredients it is not sushi. If you eat it thinking it's sushi you will be disappointed. 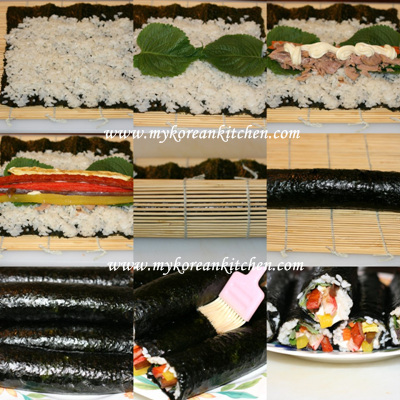 Kimbap also comes in many flavors and varieties. My favorite is tuna (chamji). I actually have to stop writing about more foods now because it's making me hungry. While, most of Korean food is delicious they do have some strange combinations. First, Koreans have an obsession with Spam. So strange given that Koreans are also obsessed with health and think that their food is extremely healthy (I would say partially true). They put in spam in soup, in kimbap, as a side dish and also enjoy giving Spam packs as gifts. Fortunately, I haven't received a Spam pack yet. Second, Koreans enjoy these strange little hot dogs. They also put them in kimbap (no thanks! ), and most recently at school I had some hot dogs with little dried anchovies. Interesting...Processed meat is not my favorite and is most certainly not healthy. Apparently during the way and post war there was an abundance of Spam from the American army and Koreans just got used to eating it that it's basically been incorporated into their cuisine now. Very strange! Enough about food. My stomach is growling!